A bit like raisin bread without the raisins. Two pounds light dough, one pound and a half of sugar, three quarters of a pound of butter, four eggs, cloves and cinnamon, one pound of raisins, one teaspoonful of pearlash dissolved in milk. Molasses Dough Cake. 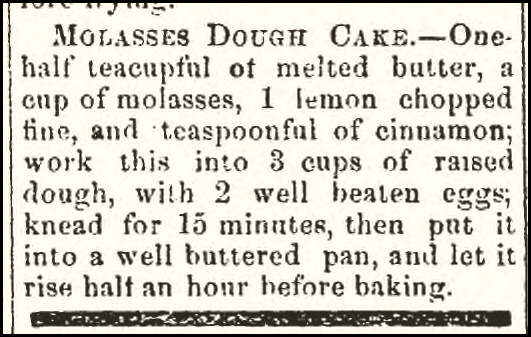 — One-half teacupful of melted butter, a cup of molasses, 1 lemon chopped fine, and teaspoonful of cinnamon; work this into 3 cups of raised dough, with 2 well beaten eggs; knead for 15 minutes, then put it into a well buttered pan, and let it rise half an hour before baking. Roll about one half inch thick, and when light, spread with butter, cinnamon, and sugar. 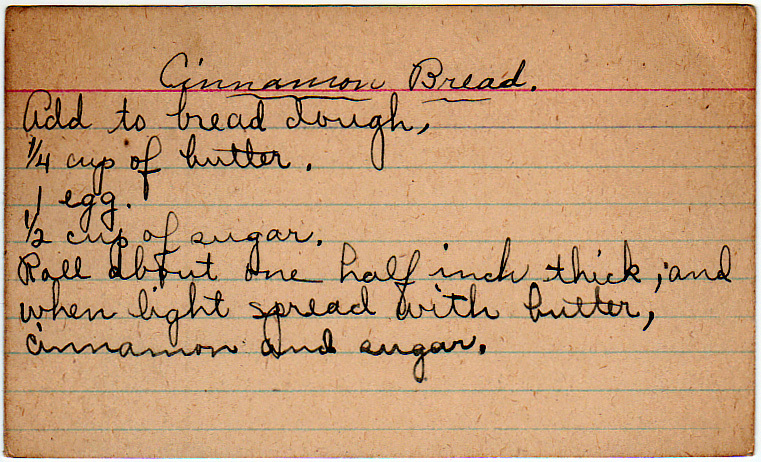 Yesterdish suggestion: While you could hypothetically use about a cup and a half of any bread dough, if you want to try this as a “dough cake,” use half a recipe of quick process bread from Avon Lake, Ohio. The 1960s version. It’s basically a soda cracker pie, which we’ve seen before. Don’t let anything else burn, for that matter.